South Africa has a rich variety of cultures and traditions. To celebrate this, we have started a new series which will highlight a different culture in each issue of Vuk'uzenzele. The first of the series looks at traditional Zulu dress and its meaning. 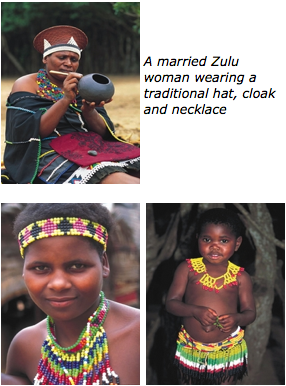 Traditional clothing is an important part of Zulu culture. It is colourful and bright and usually includes beautiful bead- work for women and children. Unmarried girls’ clothing include long strips of twisted beads called “izincu” around their ankles, elbows and waists. Young girls also wear short beaded skirts, colourful necklaces and beaded headbands. Children wear bead-work around their waists and necks. 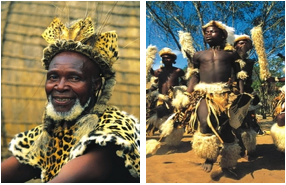 Zulu men traditionally wear a variety of clothing made from different animal hides. Like married women, married men also have special status. The front coverings for married men, for example, is called “umutsha” and differs from those worn by boys, which are smaller and called “iqoyi”. The back covering worn by men is called “ibheshu”. “Isicoco” is a head-ring worn by men and “imbhata” is a circular cowhide skin worn around a man’s neck. It used to be worn only by men who had killed another in battle. The shield worn with battle dress is called “ihawu”. Battle dress also include arm and ankle bands made of animal hide.